Brian Smith was admitted to the Georgia Bar in 1997 after receiving his undergraduate degree and his J.D., with honors, from the University of Florida. 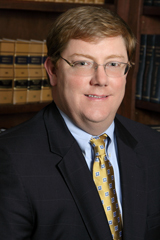 Brian joined Moore Ingram Johnson & Steele in 1997 and is a partner in the Tax and Estate Planning Department. He is a member of the Cobb County Bar Association and the State Bar of Georgia. He is also a frequent speaker to civic and professional organizations on estate planning and tax topics. Brian was born in Atlanta, Georgia, August 19, 1970. Brian and his wife, Jennifer, live in Marietta with their sons, Andrew and William. The Smith family enjoys University of Florida athletics, youth hockey, and spending time with family and friends.